It’s September and time to celebrate! 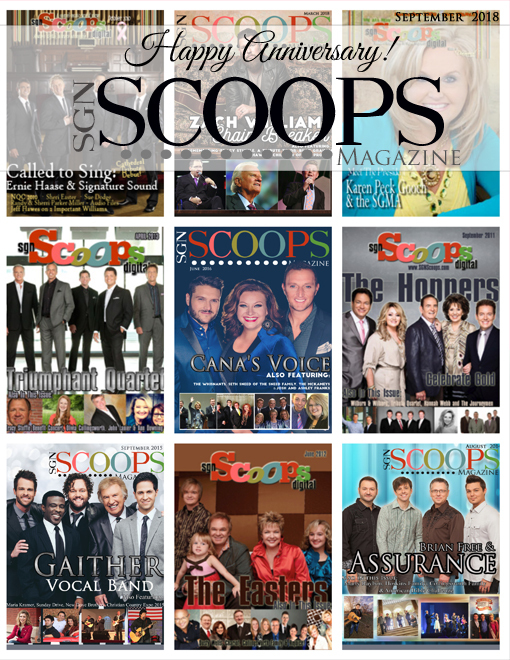 At SGNScoops Magazine we are celebrating many anniversaries this month. Join us as we live it up with Les Butler, recounting the ways his 40 years in Southern gospel have been made memorable. September marks 25 years for Rob Patz and nine years for SGNScoops and we look at how you, our friends and fans, have enriched our lives. We hope you enjoy this issue which also celebrates the songs of William Lee Golden and the Oak Ridge Boys by John Herndon, and Kody Erwin of the popular young family group, the Erwins, by Erin Stevens. Discover the Diplomats, the Envoys, and Paul Wilson with the Blind Pig and the Acorn. All this and so much more! Read SGNScoops again for the first time and hear the love of Jesus Christ echoing in our pages. Thank you for being a part of our lives.